Welcome back, Summer Series friends! 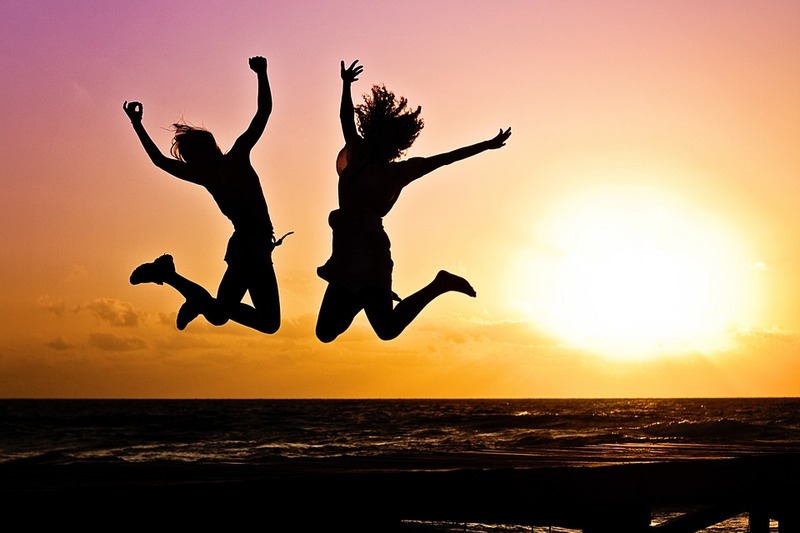 This Wednesday was the first official day of summer for all of us in the northern hemisphere (even though it’s felt like summer for a while now), and that means beach vacations, barbeques and general outdoor festivities. Summer is also the time of year when the Sun comes out to play. This week, we’re focusing on all the fun experiments you can do while having fun in the Sun this Summer! It almost seems like the Earth is closest to the Sun in the summer, when in fact, the Earth is the closest to the sun in wintertime. The reason temperatures rise is because of the way the Earth is tilted on its axis. During the summertime, rays from the sun hit the Earth at a steep angle, maximizing the rays’ energy. The Sun is 4.6 billion years old, which is the same age as the planets in our Solar System. This is because the Sun and the planets all formed together from a diffuse could of hydrogen. One million Earths fit inside the Sun, but eventually the Sun with shrink to the size of the Earth! After the sun’s giant phase (when it actually swallows up the Earth), it will collapse into what is called a white dwarf. Light from the Sun takes eight minutes to reach the Earth, and the speed of light is 299,792,458 meters per second. NASA is planning a 2018 mission that will send a spacecraft to “touch the Sun,” sending it closer to the star’s surface than ever before. Scientists are hopeful that this mission will help solve mysteries like how the Sun can fling solar winds at supersonic speed and why the Sun’s atmosphere is 300 times hotter than its surface. Fingers crossed the mission is successful! Some people choose to harness the Sun’s heat for culinary purposes. I once saw someone baking cookies in the Texas heat from the dashboard of their car! 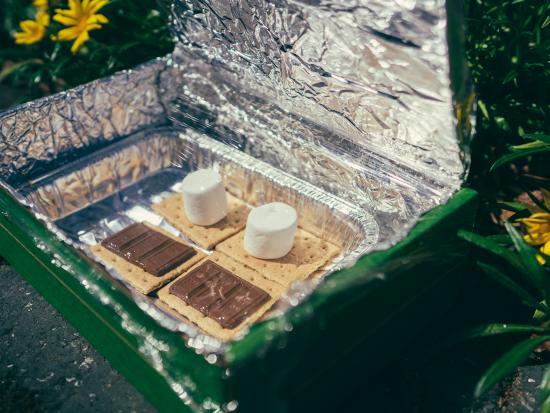 Instead of using your car, why not make a solar oven for s’mores? Kiwi Crate Inc. provides instructions for turning a box with a hinge (like a pizza box) into an oven using aluminum foil, plastic wrap, and tape. Depending on how hot it is outside, you should have gooey and delicious s’mores in roughly 20 minutes! 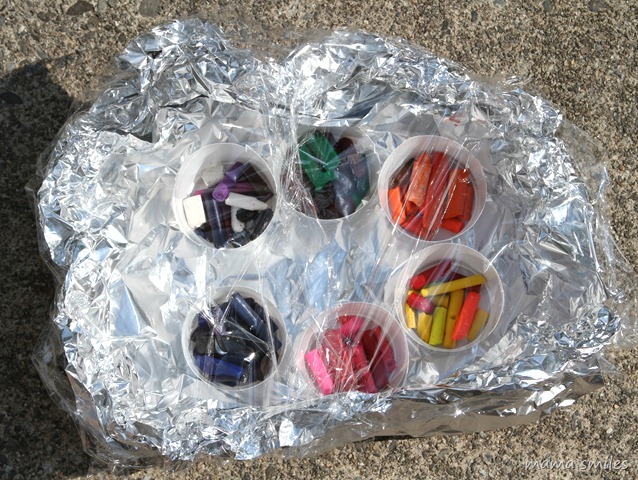 Blogger Sarah from Frugal Fun has turned those hot summer days into a fun experiment for younger learners. Gather items from around the house (ice, butter, a square cut of soap, crayons, etc.) and put them into a muffin tin. 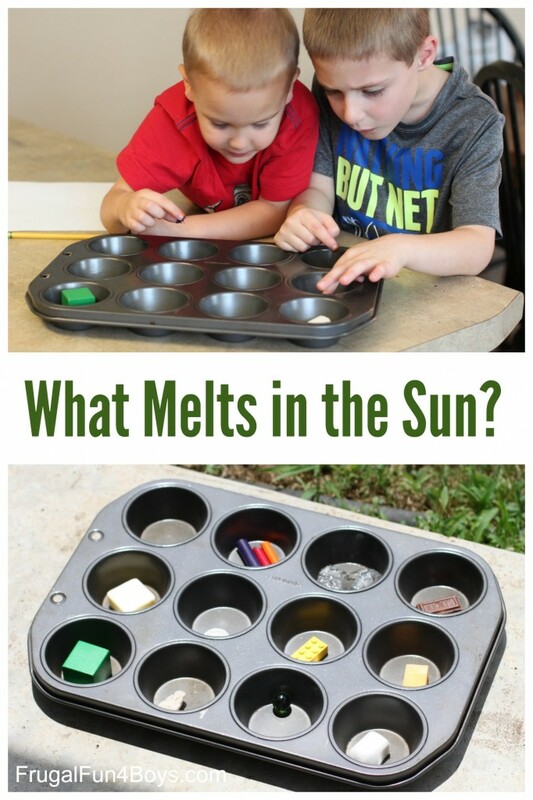 Have your child hypothesize about which items with melt. Then place the tin out in the Sun for 10 minutes. Afterwards, record the results! You can also look up the various melting points of all of your items and compare. So now that you’ve discovered what will and will not melt in the Sun, it’s time to put the Sun’s power to use in this crayon-making activity! MaryAnne from Mama Smiles upcycles broken crayons into these multi-colored works of art. MaryAnne used dixie cups to create molds, but you could be creative with your mold choice. Put the molds outside on a hot day and watch the magic unfold! Sundials are devices that tell the time using the position of the Sun. They’ve been used for ages, and the earliest known sundials were used by ancient Egyptians starting around 1500 BC. It’s really easy to make a sundial, and Raising Arizona Kids even provides a free printable clock-face to help! 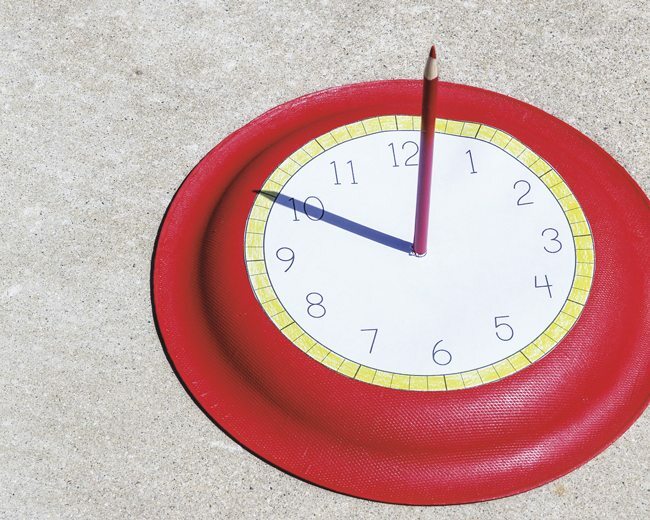 Cut out the clock-face and glue it to the back of a paper plate. Then punch a hole into the center of the plate and stick a pencil through the hole. Make sure that when you position the sundial, the “12” should face north. If you’re planning on spending lots of time outside you should make sure to protect your skin with sunscreen. While we need the Sun’s rays to survive, they can also be very harmful. 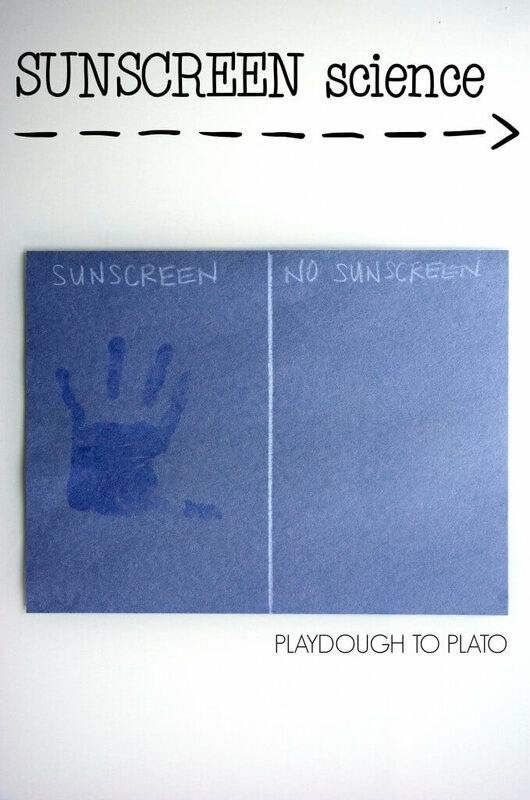 Teach your child about the importance of sunscreen with this simple experiment. All you need is sunscreen, dark construction paper, and a colored pencil to draw a line down the center. Put sunscreen on your child’s hand and have them make a handprint on one side of the paper. Wait for the print to dry, then put the construction paper out in the sun. After a few hours, bring the paper inside and see how the sunscreen protected the paper for sun bleaching. Sunscreen is a barrier between your skin and the Sun, so make sure to apply plenty before hitting the beach! 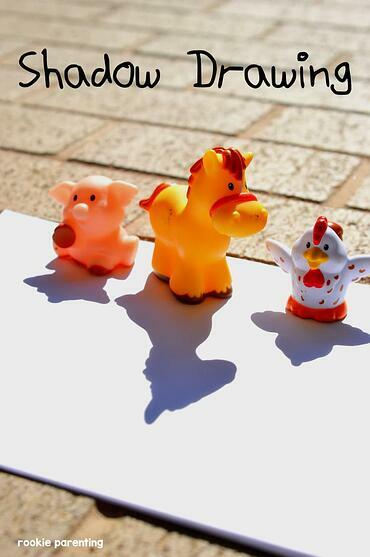 If your child enjoys arts and crafts, try out this fun shadow activity! Arrange several objects at the edge of a piece of paper either early in the morning or late in the afternoon when the shadows are longest. Have your child trace the shadows with markers for some funky artwork. The Sun is a crazy cool star, and there are so many ways we can learn about it! If you’re looking for more experiments, head over to NASA’s education page for a for more activity ideas. Until then, stay tuned for next week’s summer learning post!